Yes, you read that right. We did NOT replace our baseboards. I will show you how to make this work without that added work and expense! Pretty awesome little trick. 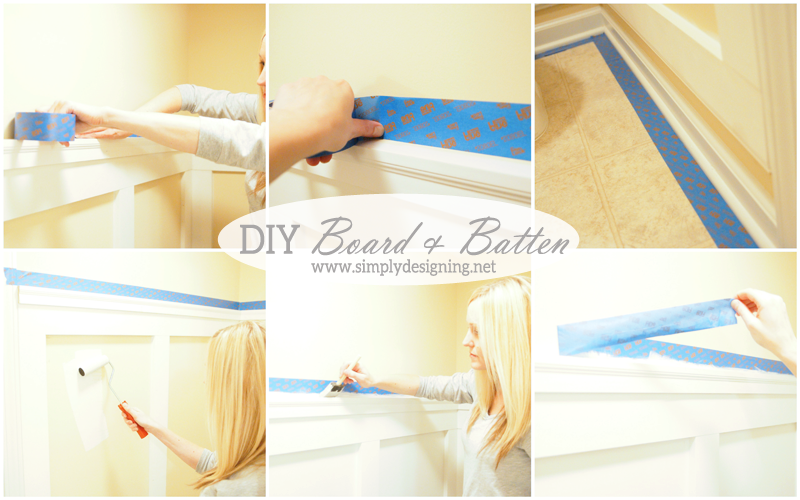 Also, I am super thrilled to be able to work with both The Home Depot and ScotchBlue™ Painters Tape to bring you this post today and to be a part of their amazing Blog Hop! Woot woot! 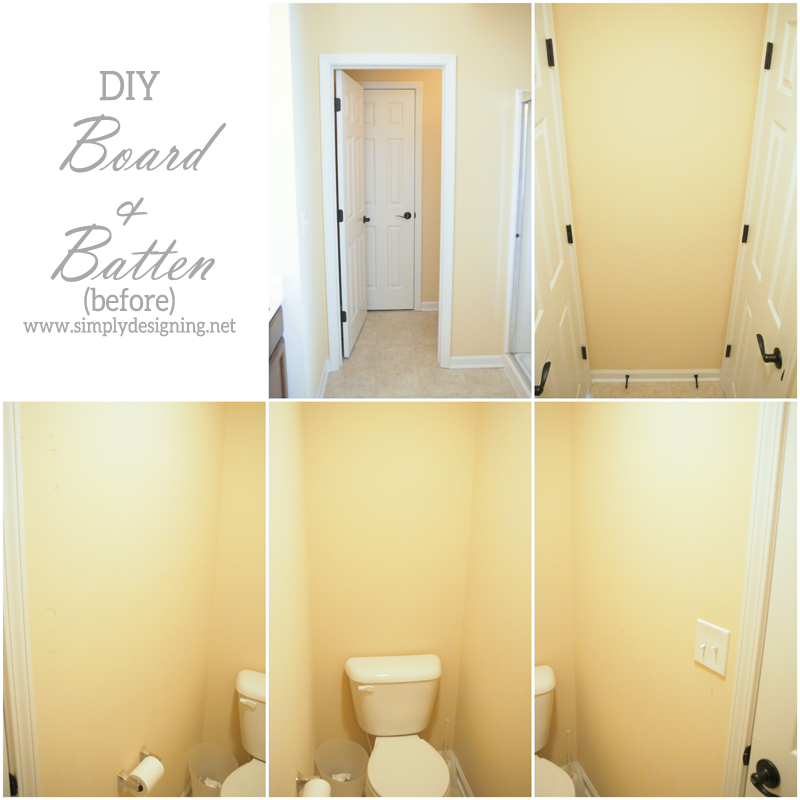 So back to my project of the day…we did not do this Board and Batten throughout our master bathroom, just in the toilet room. Because this room simply holds a toilet, and a closet, it is teeny tiny. It has no windows and prior to working on this project, had no decoration either. It was blah and a bit dark. 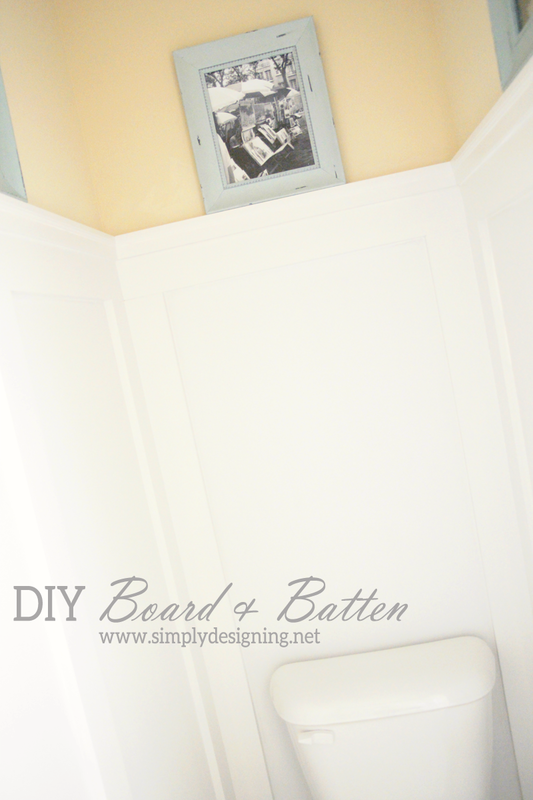 Adding white board and batten to our toilet room instantly lightened and brightened the room! And it also helps the room feel taller which in turn helps the room not feel as small. So excuse the cramped photos…but here are a few before shots of our boring master bathroom toilet room! Really it is just four blank walls and a toilet. Ha! Not much to see here. Well…until we worked a little magic! So we headed to one of our absolute favorite stores, The Home Depot! And we gathered our supplies so that we could begin building! 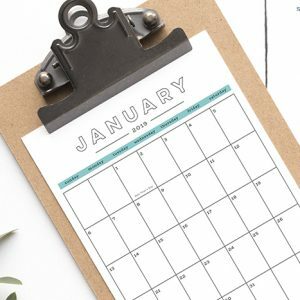 1″ x 4″ will be used for a top and bottom horizontal border and your vertical pieces, so get enough to be able to horizontally go around the room, twice. Plus enough for all of your vertical pieces. Be sure to add a bit extra for your cuts and just in case. 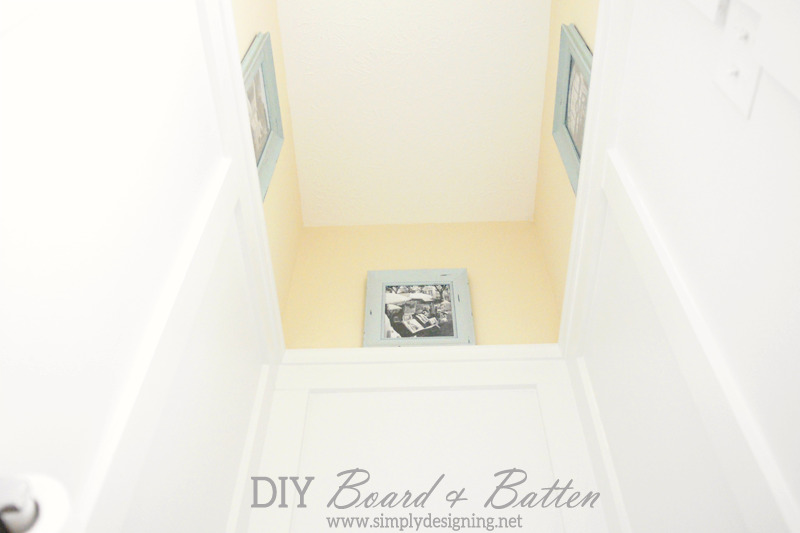 Get enough top and bottom decorative trim to go around the room horizontally. Be sure to add a bit extra for your beveled cuts and “just in case”. 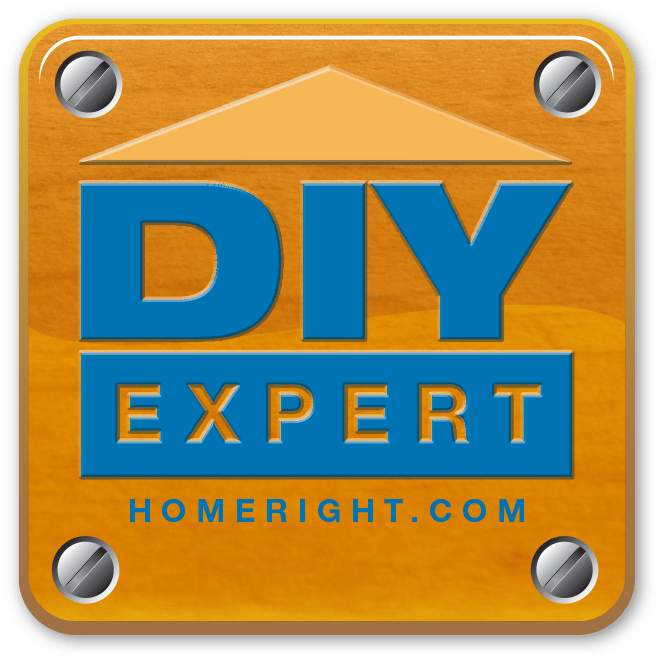 You do not have to buy pre-primed wood. However, The Home Depot had a great selection and we knew it would save us a ton of time and money since we wouldn’t need to prime the wood ourselves prior to painting! So consider buying primed wood if possible. 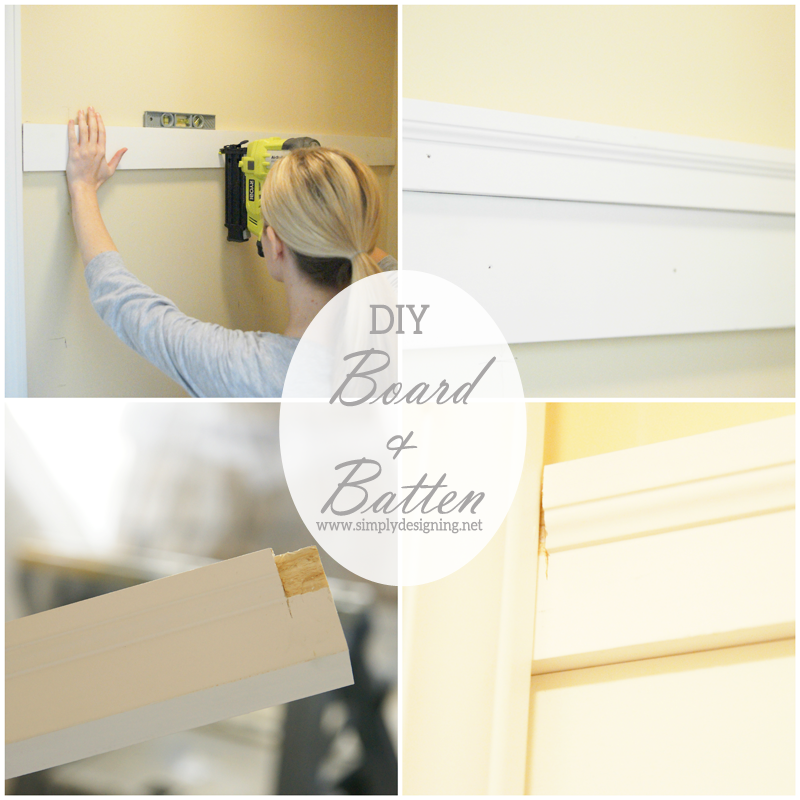 Steps for installing board and batten. The first step was to determine the height we wanted our board and batten to be. We decided that we wanted our 1″ x 4″ top horizontal piece to be equal to a horizontal piece found on our doors so we began there. We first installed our top horizontal 1″ x 4″ piece by lining the height up with a particular piece in our door and then used the nail gun to adhere it in place. There is no need to bevel the corner cuts on this piece of wood, but you can if you like. Be sure to use a level during this step! 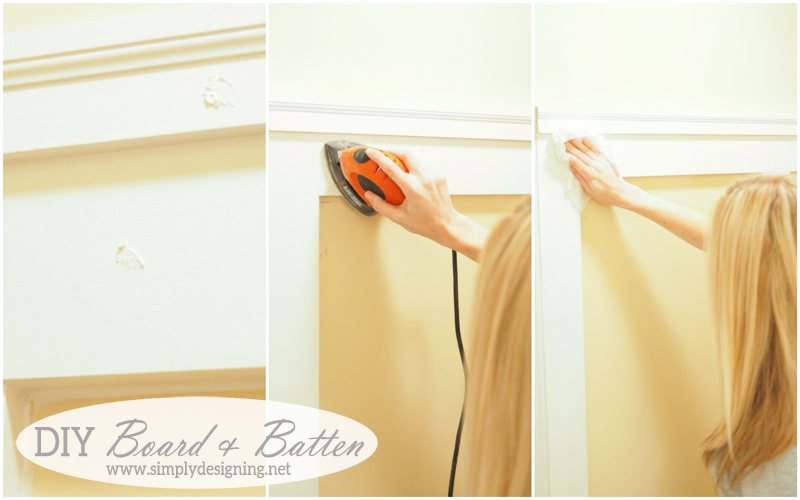 Next, we placed our top decorative trim on top of the 1″ x 4″ top piece and nail gunned that into place. We cut all of these corners at a 45-degree beveled edge so that they fit together well. We had one “tricky” wall where the trim would sit very snugly between two door frames that met where the trim would go at a 90-degree angle. Because of how thick our trim was, we needed to notch out a bit on the top of our trim to fit underneath the door frame. Then we worked on our bottom molding. 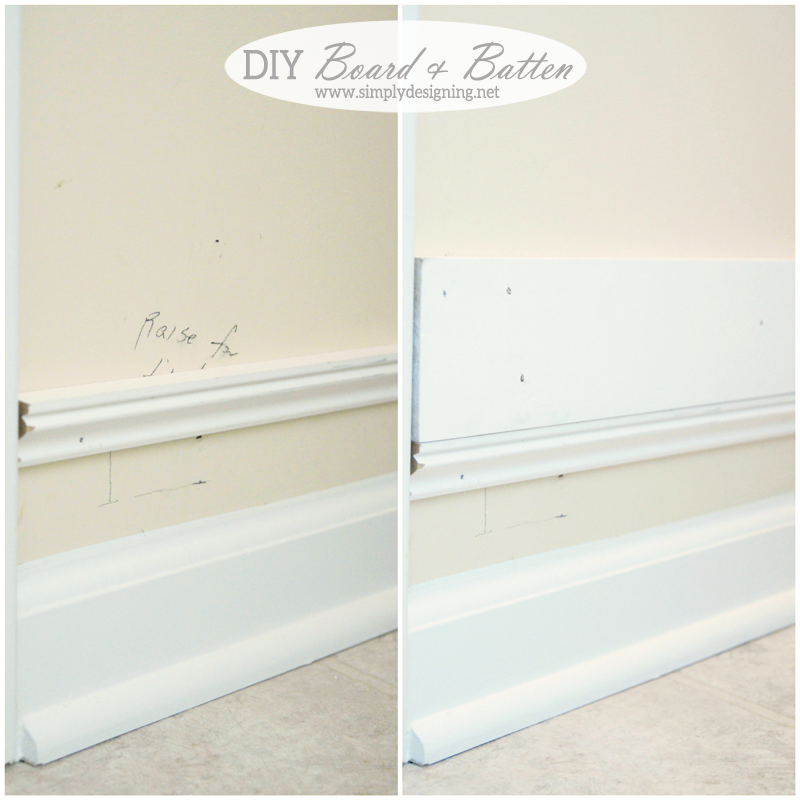 We desperately did not want to replace the baseboards, however, because baseboards angle towards the wall at the top, it would look silly to place a 1″ x 4″ board directly on top of it. There would be an awkward overhang and that would bother the perfectionist in me! So we did the exact same thing we did when we installed our DIY Plank Walls, we installed a small piece of trim, upside down, just a bit above the existing baseboards. We found a cute decorative piece of trim where one side angled in, and the other angled out and we knew this would be perfect. Again we used our nail gun to nail this trim into place. Break out your level for this step as well! And then we installed a 1″ x 4″ piece of wood directly on top of the bottom trim using our nail gun. Once the top and the bottom trims were installed, it was time to install our vertical pieces. Again we used our 1″ x 4″ wood pieces for this portion of the project. We simply measured the height in between the top and bottom trim, cut, and used our nail gun to install these. We wanted to have a board extending out from either side of each corner, and at every door jamb. So we started there. In theory, you should have vertical boards equidistant from each other. However, due to wall size and variation, this isn’t always possible. Wour eye won’t notice a slight difference when the walls are perpendicular or parallel to each other. So you can actually get away with a bit of fudging here and no one (except you) will know! We ended up placing a board in each corner and every place our wall ended (like into a door jamb). We left the two smallest walls alone at that point. Putting another board in between them would have made the board and batten pattern too busy. On each of our longer walls, we placed another vertical board directly in the center. All of the spaces between the vertical boards are slightly different, but it only varies within about an inch and you can not tell at all! You would honestly have to take out a tape measure to find any differences. The eye just naturally sees the rhythmic repeating pattern of the board and batten and your brain interprets it as equidistant even though there is a slight variation. So that is what worked for us. You may have to get a little creative figuring out how to make this work in your particular space! At this point, we had originally intended to do another horizontal piece in between the vertical boards, but we decided that it would look too busy for such a small space and so we left it as is. Then we caulked around every single edge and joint. This is what gives you your nice, finished, professional look! So take your time to caulk well. Then we applied wood putty to every nail hole. Again, this will give you a nice, finished look so be sure to do this. Then we let it all dry completely. In fact, we took the rest of the night off and went to bed! Next comes my least favorite part. There is always one part of DIY-ing that isn’t anyone’s favorite. And mine is sanding. It just makes such a mess. So for whatever reason, it is my least favorite part! But it is desperately important! So even if you don’t like it, you can not skip this step! So I sanded it well, and then I wiped it all clean! I love to use baby wipes to clean sawdust off of surfaces, but a tack cloth or clean rag will work well too. Finally, it was time to paint! We used ScotchBlue™ Painters Tape for Delicate Surfaces with Edge-Lock™ Paint Line Protector. We simply ran this along the top of our trim and along the bottom trim near the floor to protect our walls and our floors while painting. I love their Delicate Surfaces tape because it is perfect for use on delicate surfaces including painted walls! And I hate it when I tape and paint an area, only to remove the tape to have it take off paint! That is the worst! 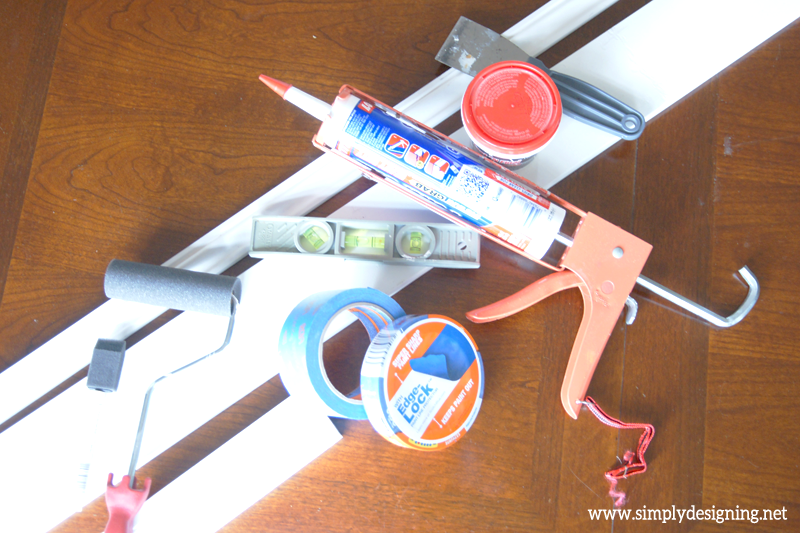 And ScotchBlue™ Painter’s Tape went on simply, and came off without a single hitch! It was perfect! So we taped, painted (several coats) and then took the tape off. 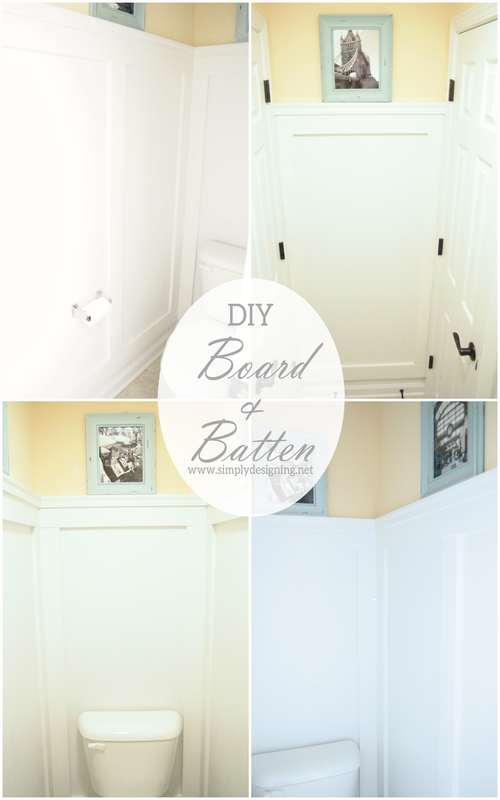 The next day I was ready to style my new board and batten bathroom! After talking with my husband and doing a little shopping at the local craft store, I found the most beautiful, aqua, distressed frames! And I knew these would look really nice in the bathroom! They gave it a perfect pop of color without being overpowering and I honestly just loved the frames!! So I took to Facebook to try to figure out what to put in the frames! You guys gave me some of the most amazing suggestions of places to look for prints!! 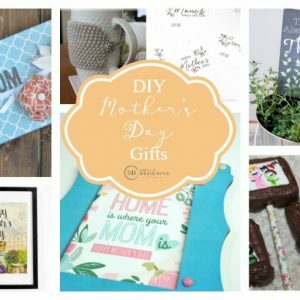 I found some really pretty ideas, but nothing spoke to me. I also didn’t want to use photos of my family in the toilet room…I didn’t want to feel like I was being watched while in there! So after hours of searching through all your suggestions and not finding anything that truly spoke to me, I decided to use a few photos we took while vacationing in fun locations over the years! I turned them black and white, sent them off to be printed, and LOVE how they look in there! Especially with the aqua frames! I honestly can’t believe how much I love my bathroom now!! (Yes I know I have said that before HERE, HERE and HERE.) But it is truly amazing how much a little elbow grease, some wood and paint, and a few decorations can truly transform a room! Our bathroom feels lighter, brighter and even bigger due to our board and batten transformation and it finally feels more like my home rather than just another room in our home that wasn’t decorated (I have many of those!). This year’s Summer Blog Hop is called “Get It, Got It, Go” and is being hosted by Kate at Centsational Girl’s blog! 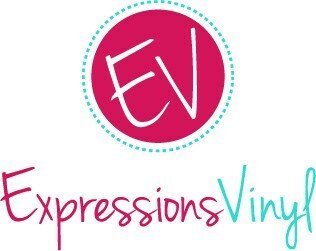 Be sure to click below to see all of the other fabulous projects! To learn more, visit ScotchBlue™ Painter’s Tape on Facebook, Twitter, and Pinterest. 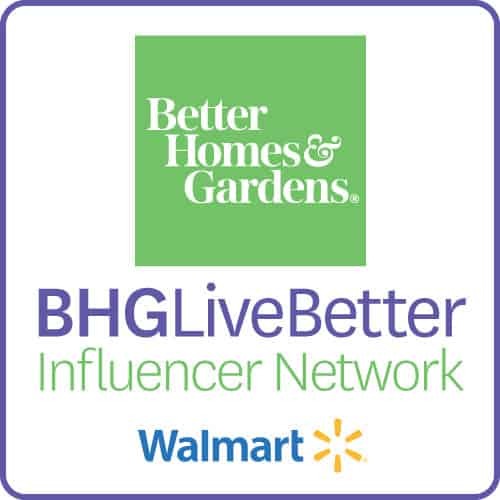 Also be sure to visit The Home Depot on Facebook, Twitter, and Pinterest. I would put it towards our (pending) project to re-screen in our back porch. Plants for our new patio! I would buy subway tile for my kitchen backsplash! white wood blinds for my bedroom. that looks great, and i agree, the aqua frames really make them stand out. i would totally buy more pots and plants-since we put in our little patio, i&#39;m spending a lot more time outdoors. thanks. I would buy a closet organizing system. I would get bathtub faucet heads and tiles. I would buy new decorations/plants for my patio! Wood trims for sprucing up a bathroom. I would use it to buy paint for our new house! I would put it towards garden supplies! I&#39;d spend it on outdoor furniture! I think I would buy some nice hanging baskets for the front porch. It looks fabulous!! I would by a backsplash for the kitchen! I would put it towards a lawn mower! I&#39;d use it towards gettting my new kitchen floors. We&#39;re updating our entry so I&#39;d buy paint. I would buy a nail gun and miter saw! new paint for my living room!!! I would purchase paint and paint the outside of my art shack/studio. May I add it desperately needs it! We are turning 4 year-old twin boys&#39; bedroom into a real boys room for upcoming double 5 birthday!!! So paint, and fun! i would love to redo my bathroom<br />or maybe a ceiling fan for my room! I would use it towards new plants for my backyard. Love your project! 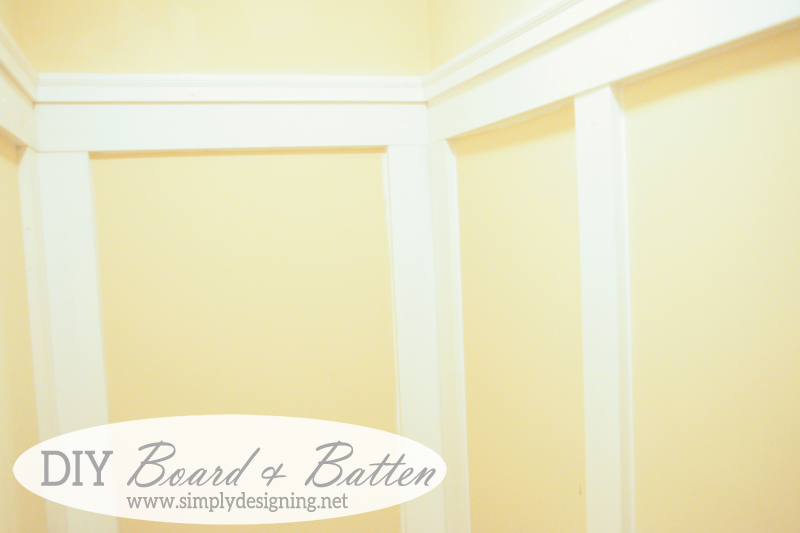 We did board and batten earlier this year in our home. It makes so much impact to a room! I would buy some hanging baskets for my back patio. Paint. I have lived in my house for 8 years and have never changed the decor. It&#39;s totally out of date. I think I would buy some concrete sealer. 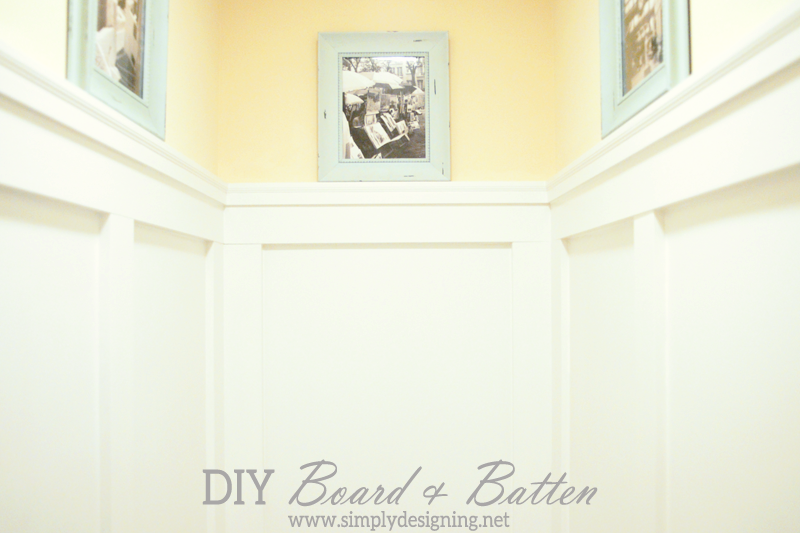 Would love to try the board and batten idea I saw. It utilizes paint to create the idea of paneling. Very nice. I need to paint several rooms, so I can use all the great ideas I get from Home Depot. We are slowly trying to finish our basement. We would use the gift card toward something for that…maybe drywall or paint. I would buy stuff for my patio…flowers, a chair, maybe a few do oration pots. Martha Stewart Paint ..Thanks for the Chance! I would give it to my husband and let him pick out some tools. He really would like that. I would love to put it towards a new front door to our home! Ours is old and we get such cold air coming thru in the winter! Have to put blankets around it! You have the cutest little bathroom!! I&#39;d buy flowers for my garden. I would buy paint and some painting supplies! I would probably spend it on patio furniture. We are repainting most rooms in our house. This would go for paint! OOOOOOhhhhhhhhhhh – I love this. Being that we are just about ready to get our keys for our house being built – I am sure I could find all sorts of things to pick up at Home Depot. The yard will probably be our first thing – but I have 2 water closets that I would love to do this to. So I&#39;ll be back to double check instructions again. Thanks!!! Paint for our master bath. Paint and some new flowers for our garden! Rain guards for our gutters…boring but so neccessary! I need a little of everything! !